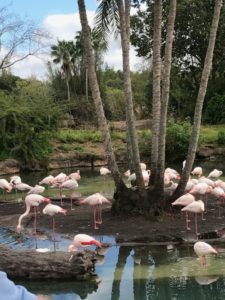 Did you know flamingos are born with gray feathers but turn pink because they eat a lot of shrimp and other food that contains alpha and beta carotenoid pigments? These pigments cause the color of the flamingos’ feathers to change to pink. I guess it is true what they say: we are what we eat. Or what we put into our body. If we hang out with people who are negative, eventually we tend to take on their pigment and we become negative as well. If we keep company with people who are disrespectful, their pigment can rub off on us and we can become disrespectful also. But the exact opposite is true as well. If we surround ourselves with positive people, we tend to take on the positive pigment in our lives. If we hang out with giving people, our pigment can be one of generosity. Therefore, it only makes sense that if we continue to follow Jesus, read the Bible daily, worship regularly and try to live a life emulating Him, we will take on His pigment and show our true colors by acting out the love of Christ. This entry was posted in devotional, inspirational, motivational, spiritual on February 28, 2019 by Deanna Young. I’ve seen a lot of different ones in my days. I’ve done my share of yelling at them; thanking them; pointing out their flaws; and complimenting them. Yes, I was mad at them when they didn’t do it the way I thought they should and happy with them when it went as I had planned. It sounds a lot like life. When Jesus allows things to go the way I like, then I am thankful and happy. When things don’t go along with my plan, then I am angry and disappointed. Just like the referee has control of the calls of the game, Jesus has control of our life. Yes we have our own free will to make our own choices, but if they go outside of God’s rules, He can throw a flag and blow a whistle to bring things back to His plan and for His glory. 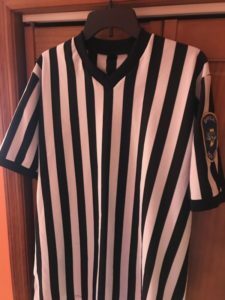 I’m embarrassed at the times I’ve yelled at referees for not calling the game the way I thought it should be called. And at times, I admit I’ve been angry at God for not giving me my way in life. The difference there is that the referees don’t want to hear from me. 🙂 God does. God can take it. He loves us. He makes the right calls for us and He knows best. And whether the referees were right or wrong, it’s not really the biggest thing in life. But Jesus’s way of right IS the biggest thing in life. He’s not playing a game and the stripes He wore were not on a shirt. Thankfully He was bigger than death and came out of the grave with victory over sin. And He lives today. I want to be a part of that team. I want to trust the One who makes all things new. I want to trust the One who makes all things works for the good for those who love Him. I want to trust the One who will usher me into victory as I breathe my last breath. It’s not a game. And He doesn’t really blow a whistle. But He did wear the stripes and He does determine the outcome of our actions. Won’t you join the winning team by choosing Jesus today? This entry was posted in devotional, inspirational, motivational, spiritual on February 25, 2019 by Deanna Young. Alarm buzzes. Covers fly off. Mind starts roaring. I don’t know about you but every day this seems to be the routine for the day. Why can I not stop thinking and stressing about what’s coming next? Are you like that? It’s almost like I wake up and think “now what was I worrying about when I went to sleep?” I find myself waking up and praying immediately for the same things I gave to the Lord right before I went to sleep. Prayer is exactly what we need to do but there’s more to that. When we pray, we should turn it over to the Lord and not fret about it. 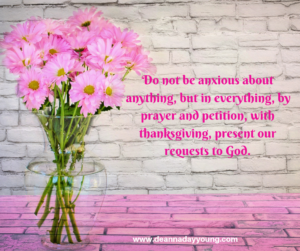 Paul tells us in Philippians 4:6 to not be anxious about ANYTHING but to give our requests to God. If we really give it over to Him, and really try not to be anxious, then we have this peace that is beyond our understanding. I’ve had it before. It’s like I think to myself, “why does this worry not bother me anymore?” And then I realize, I really did turn it over to God and that peace that I cannot explain has filled my heart and mind. It seems so simple. Let’s give it a try today. And maybe again tomorrow when the alarm goes off. And then maybe just one more day, again and again, and again. This entry was posted in devotional, inspirational, motivational, spiritual on February 20, 2019 by Deanna Young. But I Don’t Want To Read Directions. Nothing seems easy these days. “Some assembly required” makes my skin crawl because that means I will have to read the directions. People say men never read directions. Well neither do impatient women like me. I don’t want to read the directions for a new appliance, a new software or the latest technology gadget. I want to be able to use it straight from the box. I don’t like to read directions either to fill out forms or to read a map. I want the areas highlighted I need to fill out and a GPS named Sally to tell me which road to take next. As I have been reading the Bible through this year, I am now in Leviticus. Sidenote: very boooorrring book in the Bible. (Am I allowed to say that about the Bible?) 🙂 But even though it’s boring, I do find the methodology interesting. God gave the Israelites specific instructions on what to offer as sacrifice for whatever sin they committed. The sacrifice may be an animal or a grain offering. He told them exactly which kind of animal to sacrifice for which sin; how to butcher the animal; where to place certain parts of the animal; which parts were okay to eat; which parts were forbidden to eat; where the blood should be drained; what grain to use and whether the sacrifice offering included yeast or no yeast. There were a lot of directions. And if it wasn’t done correctly, it would need to be redone. I’m so thankful for the sacrifice of Jesus. I’m so thankful that although He suffered on the cross in a horrible death, that He did it so that we don’t have to follow all of those directions of knowing what to sacrifice for what sin. His death and resurrection actually made it simple for us. Only one direction. One Way. One Truth. One Life. It’s the easiest directions for the biggest reward you will ever experience. 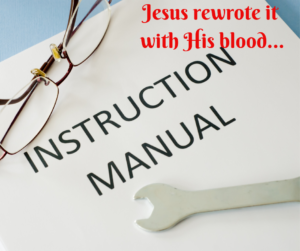 So put away the GPS and the long list of to do’s and accept the simplest gift from the One who rewrote the directions for us. This entry was posted in devotional, inspirational, motivational, spiritual on February 19, 2019 by Deanna Young.